This is a very important thing to know about if you use envirotex coated baits, such as Slammers, TR Twitchers, and Cranes. 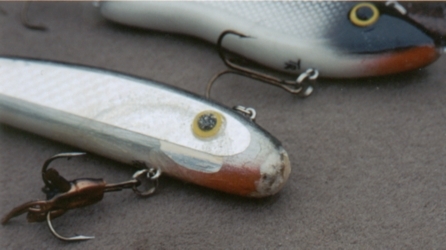 If you get a chip in the finish, usually on the nose, it is important to stop using the bait immediately. Otherwise moisture will get under the remaining finish and lift the rest of it off leaving you with a piece of wood. Once the bait is dry, lightly sand the area with course sand paper to rough up the surface and give the epoxy something to stick to. Then coat with 5 minute epoxy. Once the epoxy is no longer sticky it's ready for use again. I like to use disposable brushes like the ones for soldering to apply the epoxy. Another option for repairing the bait in the boat is to use the small epoxy packets which mix right in the packet.